Left ventricular pacing for heart failure – the GREATER EARTH trial. Cardiac resynchronisation therapy (CRT) remains an important treatment for heart failure due to left ventricular (LV) dysfunction. Its rationale is that this decreases contractile dyssynchony by reducing electrical dyssynchrony seen in bundle branch block. CRT optimisation is designed at further reducing interventricular contraction delay and maximising cardiac output through adjustment of the pacemaker settings, often by reducing the A-V delay and V-V delay. Despite this, a number of patients continue to be “non-responders” to CRT and the factors which predict which patients will respond remain somewhat controversial. The concept of sole LV pacing as a treatment for dyssychrony and heart failure is relatively unexplored. When cardiac resynchronisation therapy (CRT) was being developed, observations made during assessments of the safety of previously untested LV leads showed that with LV pacing alone, early indices of re-synchronisation appeared similar to biventricular pacing although electrical dispersion appeared worse and there were concerns that sole LV pacing would be proarrhythmogenic. That said, RV pacing is also thought to have a number of downsides by interfering with intrinsic right bundle branch conduction which is otherwise intact in the majority of individuals with LV dysfunction. A double-blind cross-over randomised controlled trial published in Circulation late last year (the GREATER EARTH trial1) showed that LV pacing produces similar results to biventricular pacing on exercise capacity, LV function or remodelling in heart failure patients with conventional criteria for CRT. 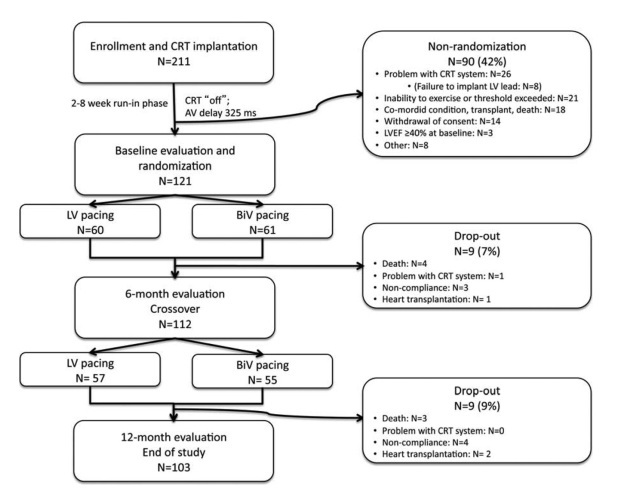 Although a similar result was seen prior to this in the B-LEFT HF trial2 (comparing NYHA classes after 6 months of LV or biventricular pacing), this study shows that switching to LV pacing in CRT non-responders may help up to 17% of them. This was a multi-centre study undertaken in Canada which included 121 randomised patients with conventional indications for a CRT-D. Baseline cardiopulmonary exercise (CPEX) testing, 6 minute walk assessment, quality-of-life questionnaires and dyssynchrony echos were performed with the devices set at DDD with a base rate of 40bpm and optimal AV delay assessed with an ECG. The patients were then randomised into LV pacing or biventricular pacing for 6 months and then crossed-over. The primary endpoint was CPEX capacity with the secondary outcome LV function and dimensions. LV and BiV pacing resulted in similar increases in exercise duration, ejection fraction and quality of life scores; and similar reductions in LV end-systolic volume and NYHA class. There were no significant differences between the groups. In those who were “non-responders” to BiV pacing, 17% benefited from LV pacing; whereas in “non-responders” to LV pacing, 31% responded to BiV pacing. To date there have been four clinical trials1,2,3,4 comparing the benefits of LV and BiV pacing on heart failure symptoms and echocardiographic parameters of LV function and remodelling. All of these have shown no difference between groups. Heart failure patients remain a heterogeneous population in terms of electrical and structural LV remodelling which seems to depend on a number of yet unknown factors. The consequence of this is that some patients to not respond to CRT or prefer certain pacing modalities. This trial is the first to show that lone LV pacing may be beneficial in some cases where BiV pacing is not. LV pacing is safe, effective and may confer benefits over biventricular pacing in selected individuals. There is rationale to use this pacing modality in patients with heart failure patients not responding to biventricular CRT. This remains an optional setting for CRT devices which will continue to depend on RV lead sensing for bradycardia and arrhythmia detection parameters for the foreseeable future. 1. Thibault B, Ducharme A, Harel F, White M, O'Meara E, Guertin MC, Lavoie J, Frasure-Smith N, Dubuc M, Guerra P, Macle L, Rivard L, Roy D, Talajic M, Khairy P; Left ventricular versus simultaneous biventricular pacing in patients with heart failure and a QRS complex ≥120 milliseconds. Circulation. 2011;124(25):2874-81. 2. Boriani G, Kranig W, Donal E, Calo L, Casella M, Delarche N, Lozano IF, Ansalone G, Biffi M, Boulogne E, Leclercq C; A randomized double-blind comparison of biventricular versus left ventricular stimulation for cardiac resynchronization therapy: the Biventricular versus Left Univentricular Pacing with ICD Back-up in Heart Failure Patients (B-LEFT HF) trial. Am Heart J. 2010;159(6):1052-1058.e1. 3. Rao RK, Kumar UN, Schafer J, Viloria E, De Lurgio D, Foster E. Reduced ventricular volumes and improved systolic function with cardiac resynchronization therapy: a randomized trial comparing simultaneous biventricular pacing, sequential biventricular pacing, and left ventricular pacing. Circulation. 2007;115(16):2136-44. 4. Gasparini M, Bocchiardo M, Lunati M, Ravazzi PA, Santini M, Zardini M, Signorelli S, Passardi M, Klersy C; BELIEVE Investigators. Comparison of 1-year effects of left ventricular and biventricular pacing in patients with heart failure who have ventricular arrhythmias and left bundle-branch block: the Bi vs Left Ventricular Pacing: an International Pilot Evaluation on Heart Failure Patients with Ventricular Arrhythmias (BELIEVE) multicenter prospective randomized pilot study. Am Heart J. 2006;152(1):155.e1-7.